MCAAS Yuma-Vincent Field on 26 Sep 1959. By the Palm tree on the left, you can see the MPS-7 search radar (Left), and the MPS-14 height-finder radar (right). Established on 2 Aug 1955 and became operational in 1956 on Vincent Air Force Base as Vincent Air Force Base Radar Site. 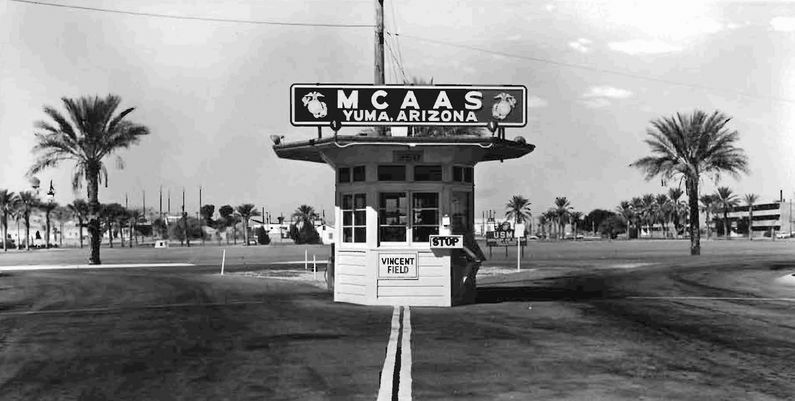 Renamed Yuma Air Force Station after Vincent AFB was transferred to the U.S. Marine Corps on 1 Jan 1959. Manned by the 864th AC&W Squadron. The station initially had both a Ground-Control Intercept (GCI) and early warning mission. The early warning mission involved tracking and identifying all aircraft entering their airspace while the GCI mission involved guiding Air Force interceptors to any identified enemy aircraft. Controllers at the station vectored fighter aircraft at the correct course and speed to intercept enemy aircraft using voice commands via ground-to-air radio. Initial equipment included the MPS-7 search radar and an MPS-14 height-finder radar. The site began operation as a SAGE site on 1 May 1961 initially feeding the Luke SAGE Direction Center DC-21. Yuma AFS was responsible for the maintenance of six remote unattended gap-filler radar sites. The unattended gap filler sites were placed in locations where the main search radar lacked coverage. These sites were equipped with short range FPS-14 or FPS-18 search radars and FST-1 Coordinate Data transmitters that sent digitized radar target data to a SAGE direction center and to the main radar site. Both the radar set and the FST-1 were dual channel to increase site up time. Maintenance teams were dispatched for regularly scheduled maintenance or when fault indicators on the FSW-1 remote monitoring equipment suggested the site had problems. The FSW-1 also allowed remote operation of specific functions such as channel changes for the radar and for the FST-1, it also allowed remote operation of the diesel generators at the gap filler site. The Yuma AFS gap-filler radars were located at Topock, Poston, Tacna, Stone Cabin, all in Arizona and Corn Springs and Palo Verde in California. Former Yuma Air Force Station Site 2 with the FPS-27 Radar Tower Still Standing 1 Apr 2019. Vincent Air Force Base was transferred to the Navy on 1 Jan 1959 and the Radar Site on Vincent AFB was renamed Yuma Air Force Station. On 20 July 1962, the base became Marine Corps Air Station Yuma. In June 1962 the Air Force began construction of a second Yuma Air Force Station (RSM-162) on a 20-acre site about 13 miles south of Yuma. Facilities built on the new site included a water tank, water conditioning equipment building, pump house, an FPS-27 radar tower, maintenance shed, guardhouse, and two 4,000 gallon diesel fuel tanks and fuel pumps. Construction stopped in May 1965 with the facility being declared obsolete before completion and installation of the radar equipment. The GSA sold the site and buildings to Automatic Products Company in April 1966. Yuma AFS ceased operation on 3 May 1963 and the 864th was deactivated on 1 Aug 1963. 8 Aug 1955 - Activated at Yuma City Airport, AZ, as the 27th Air Division. Sep 1956 - Redesignated Vincent AFB, AZ. 1 Oct 1959 - Transferred to Los Angeles ADS. mid-1960 - Site redesignated as Yuma AFS, AZ. 1 May 1961 - Transferred to Phoenix ADS. 1 Jun 1962 - Redesignated to 864th Radar Squadron (SAGE). 15 Oct 1962 - Redesignation as Radar Squadron (SAGE) revoked by SO G-4. 30 Apr 1963 - Operations ceased. The original site is now a part of Marine Corps Air Station Yuma (MCAS Yuma). The second site is in use by Automatic Products Company and has some of the radar site buildings remaining including the FPS-27 tower. Location: Marine Corps Air Station Yuma in Yuma County, Arizona. Cornett, Lloyd H. & Johnson, Mildred W., A Handbook of Aerospace Defense Organization (1946-1980), Office of History ADC, Peterson AFB, Colorado, 31 Dec 1980, 179 pages, Pdf, page 103. Winkler, David F., Searching the Skies: the Legacy of the United States Cold War Defense Radar Program, USAF Hq Air Combat Command, 1997, 192 pages, Pdf, page 99. This page was last modified 16:21, 2 April 2019 by John Stanton. Based on work by Bill Thayer.